There are family heirlooms, art, antiques, family history items and treasures that can still be saved and preserved in very good condition in a house that is in this situation! Use care in the removal process. Their preservation can make all the difference for the owners in emotionally recouping from this disaster for years/decades to come. Wow, what a photo above! 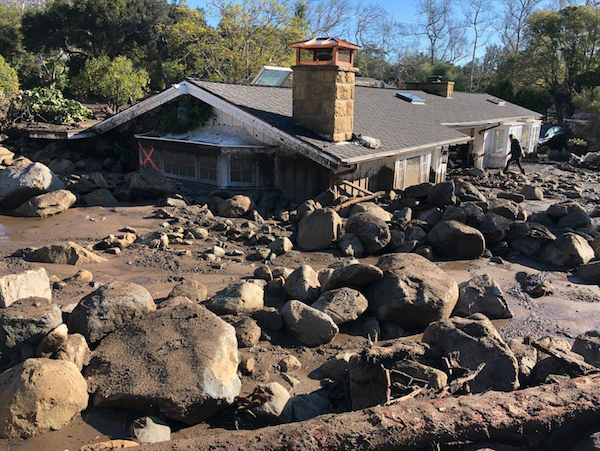 This mudslide in Montecito, CA was the result of extensive fires in the mountains above the city. When the rains came soon after, all of this came down onto the residential area. The Thomas Fire in the Ventura and Santa Barbara areas at the end of 2017 was classified as the largest wildfire (acreage) in the history of California. Over 1000 structures were lost in the firestorm driven by 40-70 mph winds in the backcountry which threatened densely populated areas prompting the mandatory evacuation of more than 16,000 residents with many more voluntarily leaving for more that a couple of weeks. Even though the fire was not driven into the cities, the wind blew smoke and ash onto 100,000s of local residents and polluted skies northward past San Francisco, 600 miles away. Within about a week from the advancement of the most dangerous onslaught of the fire’s advancement, 6″ of rain in the mountains unleashed a horrific mudslide pushing before it boulders, autos, trees and you can image what else mostly doing to damage in the Montecito suburb and closing the main artery 101 freeway for weeks. The mud slid, basically, from the mountains and hills to the beaches. We got our first call from a resident in the mudslide area today; 3 ft of mud… in the house! Unbelievably, they got out with the bare minimum… and their favorite painting… but there is a house of family memories to save as soon as they (and we) are let back in. 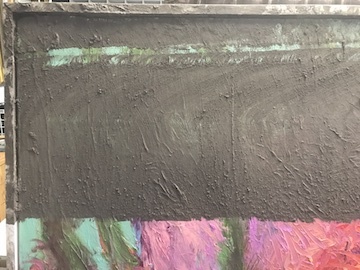 The mud on this painting smells like sewage. Its always a good precaution to protect your health when handling items from a mudslide in inhabited areas. 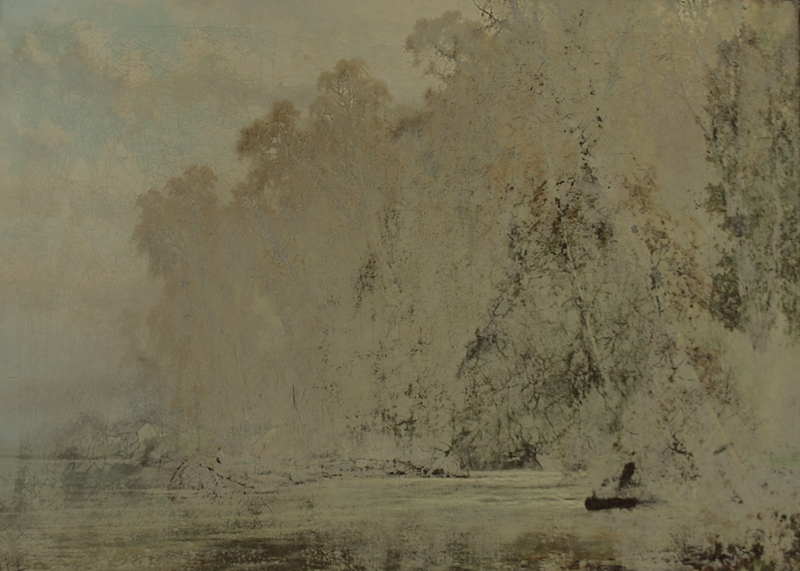 The mud etc can be removed safely from this artwork and is completely recoverable. Another day has passed and I’ve inspected about 25 works of art, all cleanable and can be returned to pre-disaster condition. This entry was posted in Disaster/Emergency Response and tagged art salvage, family heirlooms, fine art insurance claims. Bookmark the permalink. I’ve seen research that shows overwhelmingly the positive mental health benefit of having treasured possessions and memorabilia saved and preserved from a disaster. Thanks for your comment Oliver. I’ve been amazed at the gracious and grateful attitudes of the people we’ve been meeting. Many whom we’ve met have a realistic outlook on what is important in life: family, friends, good health. Yet, the items around us help us to remember family and friends and act as “memory joggers” to enrich our lives and help to retell the stories. It’s quite amazing how you can return paintings to pre-disaster condition. The restored art should help the affected people recoup.